By admin , in Parkinson's Disease on April 10, 2019 . 1 Do you have to take medication? Do you have to take medication? At some point, you will have to start taking medication. However, there is no hard-andfast rule about when you should begin taking it, because everyone has different symptoms and their disease progresses at different rates. After being diagnosed, many people go for months or years before they start medication of any kind. It’s a decision that you and your doctor should make together. Your involvement is important, because only you can decide how much of any symptom you can tolerate, and you will be the one who is going to take the medication and experience any side effects. 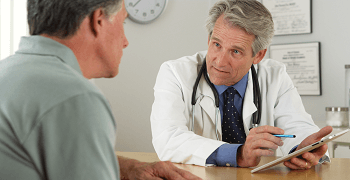 Its important to find a doctor who is experienced in treating Parkinson’s patients. This may be your internist or general practitioner, but in all likelihood you will see a neurologist (a medical doctor who specializes in injuries and illnesses that affect the central nervous system) or a movement disorders specialist (a health-care provider, usually a neurologist, who has been trained to treat diseases that affect the way your body moves, such as multiple sclerosis, and amyotrophic lateral sclerosis [also known as ALS or Lou Gehrigs disease]). PD Treatment Has Come a Long Way SOMETIMES IT can be easy to get frustrated with medical science and the lack of more effective treatments for PD. The next time you find yourself falling into that trap, consider this: prior to the 1960s, no one knew about dopamine, its role in muscle movements, and the loss of dopamine-producing neurons in the development of Parkinson’s disease. That meant that very little could be done for people with PD and the long-term prognosis was poor. These days there are quite a few medications available and many different theories about which to try first and when. Some doctors prescribe medication upon diagnosis (or even as a tool to help diagnose PD). Others believe that drugs, especially levodopa, should be delayed as long as possible because of their side effects and to possibly extend their period of effectiveness. Since PD affects everyone differently, there is no universal “right” answer. This is one reason that it is critical for you to trust your health-care provider. 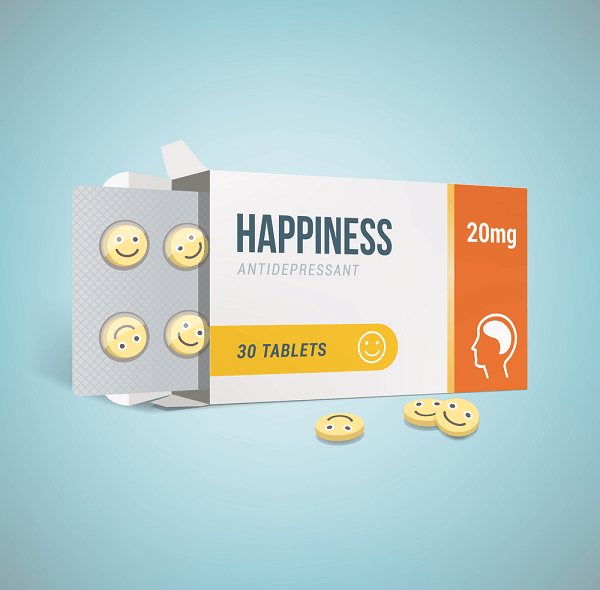 Because depression is very common in people with Parkinson’s, you may start on an antidepressant. Such medications will not help symptoms such as tremor or rigidity, but they may help you to sleep and, of course, improve your mood. Getting enough rest and maintaining your spirits can actually reduce your symptoms and thus delay the need for other drugs. With the exception of apomorphine, which is is injected into the skin to deal with an episode of freezing in advanced PD, Parkinson’s medications do not work instantaneously. (And I can almost guarantee that in your first year of dealing with a PD diagnosis, you will not be taking apomorphine). You may need to take a medication for days or even weeks to determine whether it is beneficial. This waiting is usually difficult and provokes anxiety. Keeping a drug diary can help you to deal with those emotions, as well as document the efficacy and side effects of the medication. Even when a medication is working properly, it may not relieve all of your symptoms. There is no “magic bullet” that is guaranteed to make all PD patients feel as if they do not have the disease. Never stop taking a medication without your doctor’s approval Once you have been taking a medication for several weeks, do not abruptly stop taking it without the advice and supervision of your doctor. Doing so can really throw you into a tailspin of symptoms from which it is difficult to recover. Make sure that you always have extra medication on hand for trips and vacations. These medications are the oldest in the arsenal of Parkinson’s drugs. They block acetylcholine (dopamine’s counterpart), which allows dopamine to control your movements. They are not used much these days, because more effective medicines and ones with fewer side effects are now available. Still, certain people may get some benefit for tremor and other motor problems. 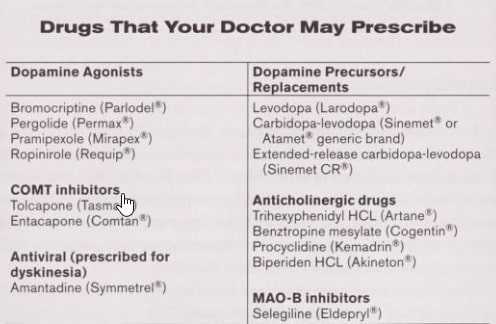 Side effects associated with these medications include dry mouth, blurred vision, constipation, drowsiness, retention of urine, confusion, and hallucinations. Because they can cause confusion, these drugs should not be used by elderly people or those already experiencing cognitive problems . Just like medications prescribed for other illnesses, the drugs used to treat the symptoms of PD can affect your entire body, not merely the specific area causing your PD. For instance, nearly any medication taken by mouth can irritate your stomach. And since PD drugs are intended to affect your brain chemistry, it should come as no surprise that they can change the way your brain regulates more than they do just movement.